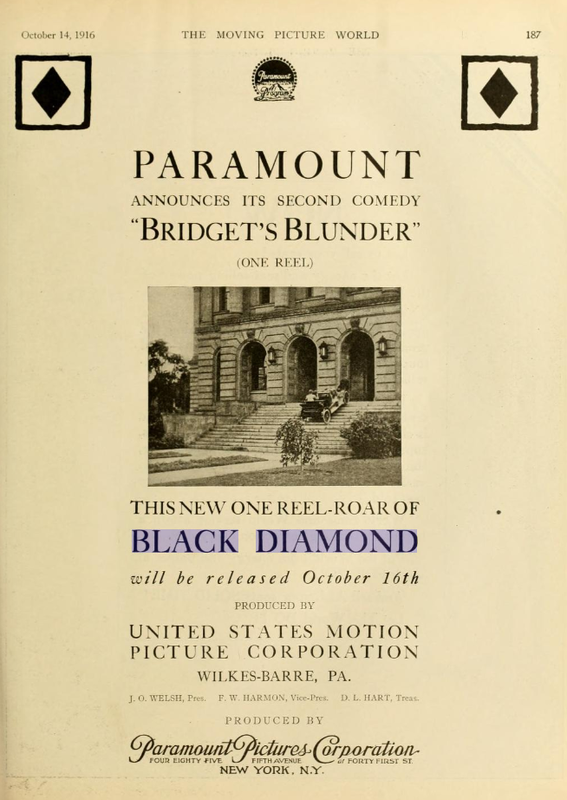 The second Paramount Black Diamond Comedy, filmed in Wilkes-Barre by the United States Motion Picture Corporation, features recognizable landmarks including the Luzerne County courthouse. When I first began the silent film portion of my Writing for New Media course, my mind instantly went to Charlie Chaplin and Buster Keaton. After taking a film course my senior year of high school, I took an extreme interest in film. We briefly touched on silent films, So I did not have extensive knowledge on the topic, but I had a base. I was immediately fascinated by them. When Dr. O’Connor announced that we would be studying silent films, and also putting on an event involving them, I was very excited. The thing that amazed me most about the course material was the fact that our very own Wilkes-Barre, Pennsylvania, was a hot bed for films and motion pictures in the early1900’s. Although I love this city dearly, I was astonished at the thought of Wilkes-Barre being a breeding ground of fame and stardom. Picturing Wilkes-Barre as “Hollywood-esque” was difficult for me to wrap my head around. Many stars, such as Leatrice Joy from “Her Fractured Voice,” went on to Hollywood after her tenure in Wilkes-Barre. Clearly, the industry exploded in size and moved west to Hollywood—exploded to a size that Wilkes-Barre could no longer house. However, it is a fascinating part of our city’s culture that is, in my opinion, not widely or commonly known in our area. I decided to put my opinion to the test. I wanted to see just how big of a secret this was to our city’s current community. I began by conducting interviews on the campus of King’s College. Since most students have not resided in Wilkes-Barre their whole lives, I decided I would also venture into the heart of Wilkes-Barre, Public Square, as well. I posed the question to all three students from King’s the same way. “Do you know if Wilkes-Barre has a history of being a part of films/motion pictures?” All three students seemed baffled by my inquiry. When I then explained how prevalent it was in Wilkes-Barre, the students were shocked. One student replied with, “Yeah…okay bud,” and walked away. However, to my surprise, each student was from a surrounding city of Wilkes-Barre. If they didn’t know, how would a student that hails from New Jersey or New York know? It was time to broaden my search. I thought that at least one individual would have had an idea, but I was surely mistaken. “That must have been a long long time ago,” said one citizen. “I knew this downtown area was bustling back in the day, but I had no idea about the film aspect. That’s pretty cool.” Out of the seven civilians that I approached, that was the closest I got to a person who knew of Wilkes-Barre’s past. It turns out that I was not in the minority when I was surprised at the news of Wilkes-Barre’s film background. Hopefully, this will change—it is too good to keep a secret. I am glad my class, Dr. O’Connor, and Tony Brooks are doing our part to spread the word. Hopefully we, along with inspiring others, can shed some light on this aspect of our city’s history. « Are words really better than silence?